Events and Festivals in 2019 - Get the Dates Sculpted in your mind! Home Travel News | Travel Guides Events and Festivals in 2019 – Get the Dates Sculpted in your mind! Events and Festivals in 2019 – Get the Dates Sculpted in your mind! The first month of the year has come to an end and the wave of events and festivals have already started in India. From kites to paintings to books to bikes to mics, we observe a myriad of events and festivals that will blow your mind in amazement. Chuck all your plans and get the dates sculpted in your mind of these fantastic events and festivals in 2019. Celebrated since 30th October 1998, the Kala Ghoda Arts Festival is the largest multicultural festival of India. Every year, millions of people from across the world pay a visit at the festive event. It is one of the most awaited festivals in February 2019 as this year will celebrate the 20th anniversary of the art and cultural festival. If you have a soft corner for art and literature, hurry up and book your last minute flights to Mumbai as the day is close. A popular music and dance carnival held every year. Rann of Kutch Festival is the event taking place in the largest salt desert of India. The festival has already commenced since November 2018 but the good part is it continues for over 2 months! Yes, you still have time to be a part of the annual carnival in Kutch. Want to have a fun-filled weekend with dance, music, food and wine? If so, head to the Sula Vineyards for the phenomenal Sula Fest. People staying in Pune and Mumbai can definitely plan it in the coming weekend. 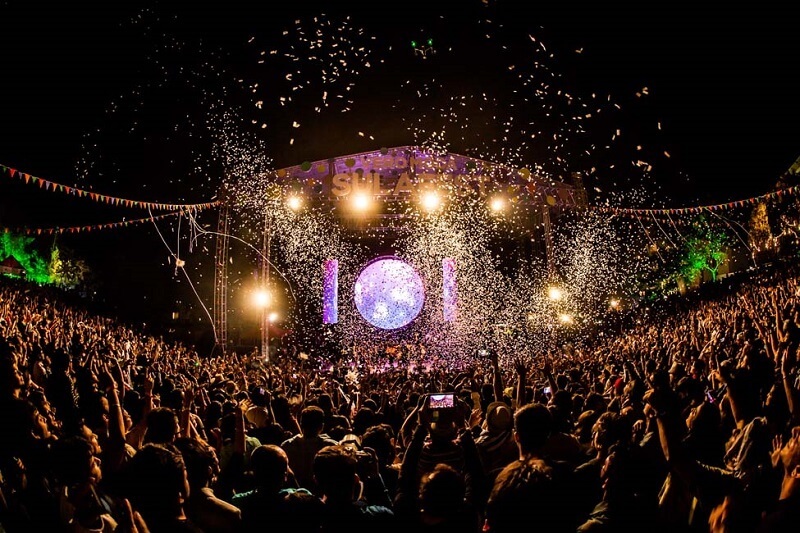 One of the mind-blowing events in February 2019 is the VH1 Supersonic in Pune. It is one of the best premium live music event rendering a powerful sense of positivity and belonging. Hurry!! Book your tickets now. It has been long since you played Holi with your friends and family? Do not miss it this year and plan a trip to the Holi Moo Festival in the capital city. Dance on the music, play with colors and lose your mind in the festive vibe around. The capital city of Delhi hosts a literature festival each year and this year it’s one of the main festivals of India in February. It is called a festival because it is much more than an event – it celebrates the power of pen. If you have an inclination for literature and cultural heritage, do not miss it. To all Sherlock fans, be a part of the interactive discussion on fan fiction work, Sherlock literature, BBC show and more. Have a conference in Mumbai in the second week of February? Have you already booked the business class flights? Extend your stay for a day or two and visit the happening Sherlock Fan Literature Fest. This is the fourth season of the popularizing Green Wheel Bike Festival. Show your love for bikes this year. Arth is an annual culture quest throwing light on music, art, culture, literature, traditions and music of India. The Kukdukoo Fest is the first Interactive Children’s Litfest that revives the splendid times of childhood tales. If you are a Delhite or live anywhere near the Delhi NCR, you must take your kids to the event. In 2019, it would be the 8th year of the acclaimed Delhi International Jazz Festival. If you are a lover of Jazz music, it would be a great time tapping on the songs of international and Indian jazz bands. St+Art Festival is an initiative to spread awareness about urban art. The movement is eventually changing the face of urban India. Sunburn Klassique is one of the big events happening in 2019. Like every year, this EDM festival will rock you hard and it has come with a “sleeker and smaller” version, the Sunburn Klassique in 2019. Are you an EDM lover? Book your tickets ASAP. The Sorbet Soiree is a get together of designers from across the country.